Josh Rosen. Credit: Steven Bisig, USA TODAY Sports. 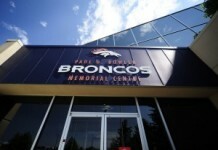 This year, the Denver Broncos can kill two birds with one stone, so to speak. Broncos fans are clamoring for the team to take a quarterback with the No. 10 pick, even if it would be a gamble on a player like Drew Lock or Dwayne Haskins. Instead, forget about drafting a QB, Denver needs to go after linebacker Devin White with their first-round pick, even if that means moving up. 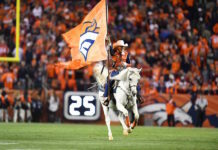 White would mean an immediate starter and, hopefully, a long-time star on the defensive side of the ball to join Von Miller, Chris Harris and Bradley Chubb. And, let’s face it, John Elway has been terrible when drafting offensive players high in the selection process, he needs to stick to what works for him, defenders. What about the quarterback of the future? Well, the Broncos can then trade their third-round pick for Josh Rosen, the youngster who was taken No. 10 overall last year and is likely to be traded by the Arizona Cardinals. 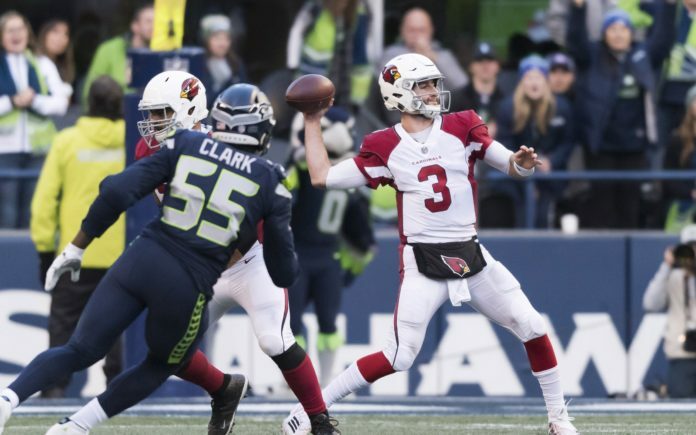 The Cardinals are about to make a crazy decision, using a top-10 pick on a quarterback one year, only to give him a single season before ditching him. That’s because, as rumor has it, Kliff Kingsbury loves Kyler Murray and so do the Cardinals. After this weekend’s NFL Scouting Combine, Arizona has seemingly inadvertently convinced everyone they’re going to take Murray with the No. 1 overall selection in this year’s draft. And when asking around the league, Peter King found multiple people to say Rosen is worth only a third-round pick. Here’s the catch, that value could plummet if they wait to trade Rosen until after they take Murray at No. 1 overall, so Arizona will be likely in a hurry to make a deal in the next 50 days. Instead of using their first-round selection on, say Lock, the Broncos could get arguably the best defensive player in the NFL draft this year and then trade their third-round pick (No. 72 overall) for Rosen. Rosen, who played three years at UCLA, had all of 13 starts last season for the terrible Cardinals. His numbers weren’t great: A 55.2 completion percentage, for 2,278 yards with 11 touchdowns and 14 interceptions. Hey, he was a rookie on the worst team in the NFL, so we should probably cut him a little slack. And, if Denver were to trade for him, coming into a team where the starter is cemented for this year (Joe Flacco) could be a best-case scenario for the 22-year old. Rosen could sit the bench, learn Rich Scangarello’s offense and bond with the “QB guru” turned offensive coordinator for a year before taking his shot at running the Broncos offense in 2020. Of course, there’s a catch with Rosen: The Broncos didn’t have him on their draft board last year per Benjamin Allbright, who’s usually spot on about these things. 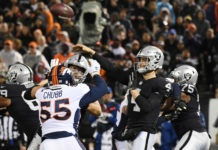 Would trading their third-round pick for a possible quarterback of the future — given the slim prospects in this year’s draft — change the mind of John Elway and Co.? It’s possible, but apparently, not likely. Still, stranger things have happened. Like a team drafting a quarterback at No. 10 overall — and trading away a third and fifth-round pick in the process — only to cut ties with him the very next year. It’s crazy, but apparently probably true. If Elway and his team found things in Rosen’s tape they really don’t like, it seems incredibly unlikely they’ll pull the trigger on any kind of trade for him, which would keep in play using that No. 10 pick on Lock, Haskins or even Daniel Jones. Or, if the Broncos don’t go QB in the first round and instead (intelligently) address one of their defensive voids, Denver could find a quarterback later in the draft and then wait patiently until 2020 and a much better QB class.